Daniel F. Shea, born in Holyoke, Mass., on June 27, 1894, was one of seven children (five girls and two boys) of Mr. and Mrs. Maurice Shea. 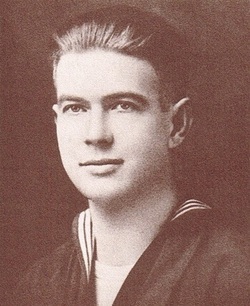 He had enlisted in the U.S. Navy as a Ship's Cook 2nd class, on December 10, 1917, and was honorably discharged on September 30, 1921, disabled from service injuries. Dan then when on to work for the Kroger Grocery chain in Michigan as a purchasing agent for meats until 1926 when he moved to Boston. A short time later, due to failing health, he entered Chelsea Naval Hospital. Following the closing of this hospital in 1933, he was transferred to the U.S. Veterans Administration Hospital in Newington. Dan was probably the best known veteran in the United States. He had earned the reputation from his cheerfulness and keen wit which never seemed to fail him despite the severity of his illness. His voice was heard over a national radio hookup of the "Cheerio Hour" of which he was the cheerleader; and his hospital room in Ward A, of which he was "chief of staff," was a center of social activity for the institution. Since June 29, 1933, he was confined to his hospital bed because of an illness that deprived him of the use of his limbs. Unable to take food except in liquid or semi-liquid form, Dan also lost his sight. During that time, St. Mary's Pastor Timmons had been the hospital chaplain. The two became friends. Dan's illness limited him to attend Mass twice a year. He was brought, in his bed, down to the hospital chapel for Christmas and Easter services. Inspired by the joy and consolation received at these times, and wishing to have a more immediate part in the worship of his Faith, Dan conceived the idea of giving a bell to St. Mary's Church, which he knew to be his neighbor, though he had never seen it. A bell could be rung out to summon Mass, and he would know when Mass was going on. Therefore, he could "attend" Mass in his own way. A consultation with Father Timmins and Major Thomas J. Bannigan, head of the hospital, brought a letter to the Meneely Bell Company of Troy, New York, requesting a bell to be provided out of Dan's slender savings from his small government compensation. Joseph Duffy, New York representative, came to Newington to survey the church tower and to see Dan. The result was that Mr. Duffy and the heads of the Meneely Company agreed that Dan should have not the small bell which he was able to finance, but a big bell of noble proportions which would be heard for miles from the open cupola of the Newington church. St. Mary's Parish received his gift during Christmas, 1935. It was a fine musical instrument of bronze and tin alloy with the inscription: "To the Glory of God and in Loving Memory of my Mother - Daniel F. Shea - Christmas 1935. But it was not tolled for the first time on Christmas Day as had been hoped. The substitution of the larger bell caused a delay. On Sunday, January 5, 1936, Father Timmins announced the gift of the bell to the parish at the Sunday masses. It was also announced that on the following Sunday the bell would be blessed at a special evening ceremony to which the whole parish was invited. Articles on Dan and his gift appeared in the local newspapers. Dan was not alone. Many people, parishioners, and friends all waited anxiously with him for the work on the bell to be finished. On Sunday evening, January 12, more than two thousand people attempted to enter St. Mary's Church for the blessing of the bell. Hundreds had to be turned away nearly half an hour before the ceremonies began at 7:30pm Two monsignori and several priests were present in the sanctuary while the lay audience included officers of the Newington Veterans Administration Hospital, town and city officials, representatives of veterans' organizations, and visitors from Mr. Shea's home town of Holyoke. Occupying a front seat and accompanied by Major Bannigan was Maurice Shea, 72 year old father of the disabled veteran. The Altar was beautifully decorated with flowers for the occasion at Dan's request. He had asked Ann Stanton (the organist at the time) to purchase flowers for the Altar and send him the bill, as he wanted the church to look its best. The Reverend Maurice F. McAuliffe, D.D., Bishop of Hartford presided over the Mass and was assisted by Pastors Odell and Timmins. Bishop McAuliffe blessed the bell ending with the words: "in honorem Danielis," signifying the prophet to whom the bell is dedicated, and in this instance, the man who donated it. Then the bell was formally rung for the first time. The sermon, a moving and eloquent tribute, was preached by Reverend Dr. John Loughlin of St. Thomas Seminary. Comparing the sound of the bell to the voices of the angels calling the people to Mass, he dwelt on the remarkable faith of the blind and bedridden veteran, unable to be present except in spirit. "It is faith like this that moves mountains. He cannot see with the eyes of his body but he can see with the eyes of God. God has taken from him many of the material values of life but he still has the love of God in his heart. He is an example to the world." Bishop McAuliffe spoke briefly on the faith and courage of Dan Shea and the historic character of the night both the parish of St. Mary's and for the onlookers who had witnessed the ceremonies. "Your faith should be increased and strengthened by the example of this remarkable man who lies on his hospital bed, blind, helpless and in pain, but who has refused to surrender to discouragement or despair," said Bishop McAuliffe. First to ring the bell at the conclusion of the service was Dan Shea's aged father, Maurice Shea, followed by Major Bannigan and Dr. Thomas Maher of the Veterans Administration Hospital. On the following Tuesday, the bells was installed in the cupola tower of the church under the supervision of Edward Kehn, expert of the Meneely Bell Company. The next day, at 4 o'clock, the first formal ringing for the benefit of Dan Shea was done by Major Bannigan. Dan's bed was moved near an open window so he could hear the solemn tones of the gift he would never see. His rooms was decorated with flowers for the occasion, he had his picture taken, and friends and staff of the hospital were present with him to watch the broad smile on his face as he lay intently listening for the first time to "his bell." Afterwards there was a little party where everyone shared in his joy. Every Sunday after that, Dan's bell was rung five minutes before each Mass, to summon parishioners to church, and to let Dan know that Mass was about to being. During the Mass, one single peal announced to Dan the elevation of the Host and the elevation of the Chalice. Also, each day, the bell rang out the Angelus for all to pause in their work to offer a prayer. Although this tradition was carried on for years, Dan Shea lived only eight months to enjoy it. He died quietly at 8:45a.m. at the Newington Veterans Administration Hospital on September 15, 1936. Funeral services where held for him at the Church of the Holy Cross in Holyoke, with Rev. Daniel A. Crowley presiding. Burial was in St. Jerome's Cemetery, Holyoke.